Abstract: On the plus side, the JAP407A boasts a nice machined base, copper fins, and a good strong 25mm thick fan up top. 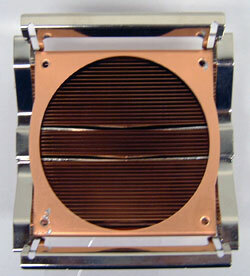 Jetart are a new company among the long list of heatsinks manufacturers whose products FrostyTech has reviewed. The Jetart JAP407A is a standard socket 478 Pentium4 heatsink which is rated for 3.06GHz speeds according to the manufacturer, and to be frank, the JAP407A is vaguely familiar of a recent Vantec design. On the plus side, the JAP407A boasts a nice machined base, copper fins, and a good strong 25mm thick fan up top. 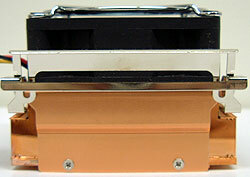 While the base and fins of the JAP407A are made from copper, the copper coloured fan shroud is actually anodized aluminum. With that copper colour to the aluminum, you could be forgiven for thinking that the fan shroud as well as the heatsink was made from copper. The spring loaded clipping system works well as it creates force between the thin copper fins, and we get good compression on the socket without placing too much stress on the underlying PCB. The seven bladed fan impeller on this 25mm thick fan creates about 55dB of noise according to our real-world measurements. The fan grill looks nice but isn't really necessary as it would be with a high-RPM delta fan. 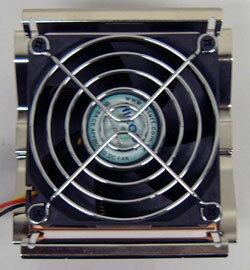 The fan connects to standard 3-pin fan header on the motherboard, and supports RPM monitoring. Top: The clipping mechanism is really well done on this heatsink because it operates within the space of the fins, and doesn't require a large path as we are generally accustomed to seeing. 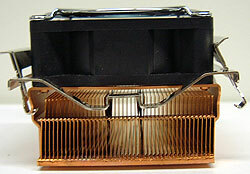 With the fan removed we can see the fan shroud and interlocking copper fins below. These assemblies of fins have become really popular of late, and give that they also increase assembly speed are probably part of the reason why copper heatsinks have come down in price to very reasonable levels. Each fin measures roughly 0.3mm thick, and are spaced 1mm apart. The fan shroud is bowed out a little at the top to accommodate the 70mm fan size. 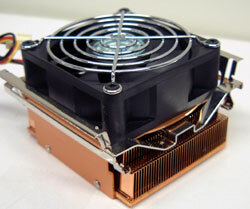 The shroud keeps the fan a few millimeters above the tips of the copper fins so there is better airflow. From the edge of the Jetart JAP407A you can really appreciate just how thin those copper fins are. The base of each fin is folded over 1mm to create the tab which is in fact soldered to the copper base. 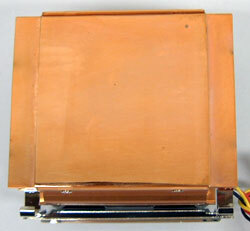 The copper base plate measures 3mm thick. The base of the Jetart JAP407A is machined pretty smooth, and very flat. To further reduce cooler weight, the edges are machined out a little as well. With the fan shroud standing proud you won't be able to lap this heatsink without first removing it. List all Jetart heat sinks that Frostytech tested?